The Most Honourable Order of Little Bedlam was a gentleman’s drinking club, created by John, 5th Earl, in 1684. It fell into abeyance at his death in 1700 and was revived in 1704 by his son, John, 6th Earl. The membership including the Earl’s friends and neighbours. Rooms on the ground floor: a Billiards room, a Saloon decorated by Verrio with Bacchanalian scenes and a ‘Smoaking’ room were home to the club’s activities. Members had to provide a portrait, often including the animal avatar by which they were drunkenly known, to hang in the club rooms. 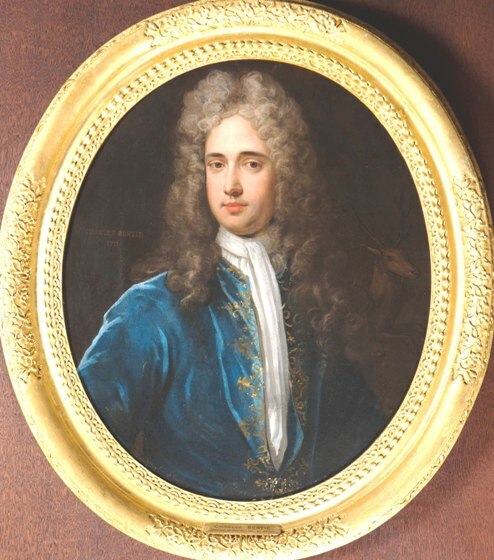 Charles Bertie (1674 -1730), portrayed aged 33, was known as Stag. Whilst 6 portraits have remained at Burghley and hang in today’s Billiards room, those of the other 22 members have left the house, probably returned to the families of members when they died or when the club was dissolved in the mid-18th Century. Very occasionally, a club portrait has appeared on the art market, usually unrecognised and unknown to us. This excellent portrait by Charles D’Agar turned up in the stock of a provincial art dealer. Most fortunately, on this occasion, the Governors of BHPT were told of the portrait and were able to acquire it for the Collection. Equally fortunately, there is a vacant panel in the Billiard room and he will be able to rejoin his fellow miscreants after an absence of some 287 years.